Roe has a home! 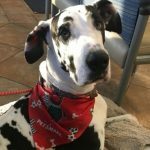 - Rocky Mountain Great Dane Rescue, Inc.
Roe has a home with her new family in Utah! Lesli and Paul have had 10 Great Danes all together, some of which have come from RMGDRI. Lesli is also a volunteer with us, and fell in love with Roe the minute she saw Roe’s story on the website. Sweet Roe has been through so much with her surgery and recovery, and is now a healthy girl who loves to run and play! She will have two Dane sisters to keep her company; Heidi who is ten, and a seven year old named Sophie, as well as 5 cats! Roe will have fun exploring the 20 acres that Lesli and Paul live on, and Lesli’s work schedule allows her to be home several days a week with her animals. We are so happy she found a wonderful home with Lesli and Paul! Way to go sweet Roe!